We test spring operated safety and safety relief valves on air, steam or liquid and on-site without interrupting the process or operation. Our trained technicians will perform three repeatable tests to ensure the reliable performance of the valve and the test accuracy. A detailed test certificate including a graph analysis of each test is provided before we leave the job site and stored in our ValvHistory™ database that can be accessed on-line by the customer at any time. 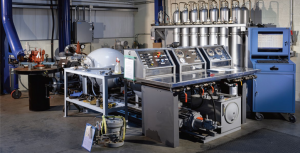 One-stop shop for all air, steam and liquid valve testing. We supply a varied selection of specialized field machining equipment available to perform many services on-site at customer installations. 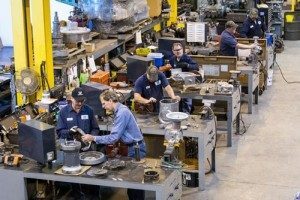 Virtually all of the industrial valve repair and specialty machining services we offer can be extended to a field setting. 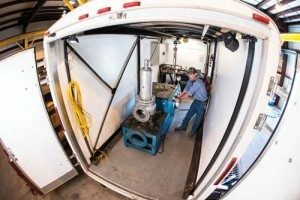 In addition, our 42’, fully equipped Field Service Trailer and our two 26’ Mobile Machining Vans enable technicians to perform field machining and preventative maintenance services on-site. We have several mobile testing units to test/repair/clean safety SRV’s and POSRV’s onsite. These fully-equipped, self-contained units allow our highly-trained and insured technicians to test valves up to 6”, 3000 PSI air/nitrogen/liquid. 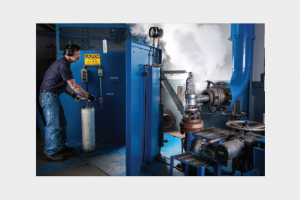 We have one mobile clean room capable of on-site testing and O2 cleaning of valves up to 3,000 PSI and components to meet industry and/or customer-specific standards to remove petroleum-based residue and prevent hazards and catastrophic failure. Our control valve department offers comprehensive repair services for any brand of control valve, either in line or in our shop. 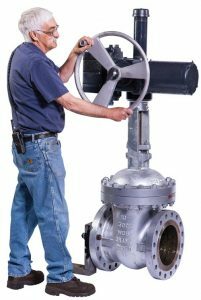 Types of valves we repair include: butterfly, reciprocating, globe, rotary, ball, plug, turbine trip/throttle, steam conditioning, blending, pressure regulators and many more, as well as positioner and instrument calibration. We also repair pneumatic and mechanical actuators and offer trim set refurbishment. We use only OEM parts for all repairs if available. All valves are tested on our calibrated flow bench according to ANSI/FCI standards. Repairing since 1982. 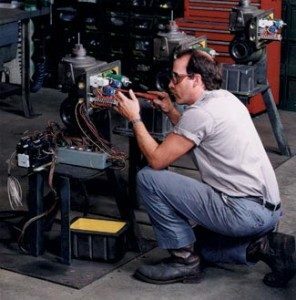 Repair service for any brand of electric or manual operator is offered. Repair all major models — and can have most repair parts in 24 hours. Repairs can be in-shop or in-line with 24/7 service as needed. Factory trained technicians. Diagnostic motor testing. Complete/comprehensive rebuilding of operators — results in further reliability to the end-user. The Portersville Converto-Gear® is our proven line of manual and electric rotary valve actuators that are exclusively manufactured at our facility in Portersville Pennsylvania. Installation on most gate, globe, ball and butterfly valves requires only a simple adapter kit and some common hand tools. Adaptation to most any size gate or globe valve with quick delivery of this product is available. We stock most all parts and can offer expedited shipping if needed. Our trademarked ValvTrak™ program allows us to take an interactive role in the management of our customer’s equipment. This proactive relationship reduces downtime and increases both productivity and visibility with regard to maintenance frequencies and documentation requirements. ValvHistory™ fulfills requirements set forth in customer specific process safety management programs. Regulatory issues of today require information as to the operational condition and mechanical integrity of your safety equipment. Portersville PRD’s approach to managing this information satisfies the rigors of OSHA PSM 1910.119 subsection (j). Ask us how. Portersville PRD is pleased to offer field and in shop service for the industrial valve and process solutions we supply to the industry. We provide industry leading, factory-trained service and support personnel to ensure all the products we sell perform in the field as designed. Our service business is segmented to provide dedicated, specialized service capabilities focused on a core deliverable. Whether you need startup service on a single valve or a complete suite of repair solutions we can handle it all – big or small. We employ experienced professionals and technicians to make sure the job meets your specifications and stays within your time constraints. We offer unmatched valve expertise through our highly qualified asset managers, experienced outage management team. Together these resources, capabilities and experience can be leveraged to meet your entire mechanical repair and outage needs. Portersville PRD offers the most comprehensive industrial valve repair services in our marketplace. Benefits for customers include increased availability and reliability, and lower cost of ownership of their plant assets.